CLEVELAND, Ohio -- They ran away with their division again, and streaked to history, 102 wins and home-field advantage throughout the AL playoffs. The Cleveland Indians have had a special season. A new one, the only one, is about to begin. Heartbroken after coming up a little short last year against the Chicago Cubs, Cleveland figured to make it to October for another swing at ending a World Series drought stretching back to 1948. The Indians are back, but there's now a 6-foot-7, 280-pound baseball-bashing behemoth standing in their way. On the same field where their magical 2016 postseason ended on Nov. 2 in a light rain and extra innings, the Indians will open the division series on Thursday night against Judge and the New York Yankees, who rallied to beat the Minnesota Twins in the wild-card game. 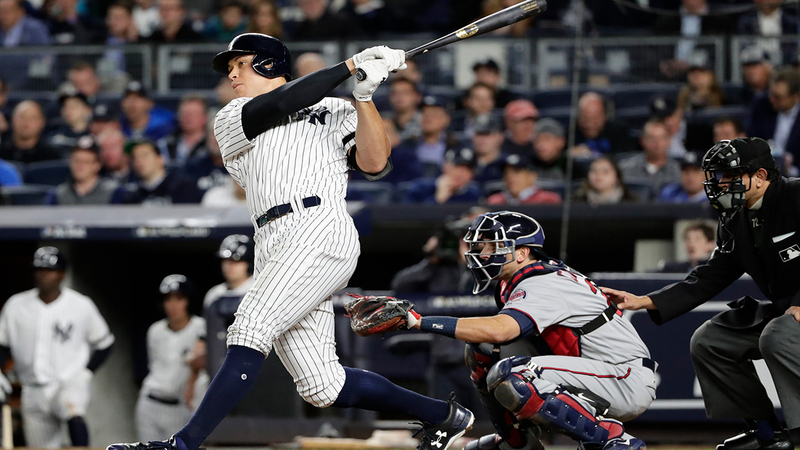 Unaffected by a larger stage, Judge hit a two-run homer in his playoff debut as the Yankees overcame a 3-0 deficit in the first inning and won their first postseason game in five years to earn a best-of-five matchup against the defending AL champions - and the team favored to win it all. "We're not done yet," Judge said after the 8-4 win at Yankee Stadium. "We've just got to keep it rolling in Cleveland." And while fans across the country are excited about watching the colossal Judge, who blasted 52 homers as a rookie and seems to hit the ball hard every time he's up, face Indians ace Corey Kluber and baseball's deepest pitching staff, Cleveland manager Terry Francona isn't as thrilled. "He's good for Major League Baseball," Francona said of Judge. "He's bad for the teams you're playing against. He's really good. From all accounts, he's a really special young man. I didn't get a chance to meet him at the All-Star Game because I wasn't there, but everybody came back raving about him as a person. "I know, if you throw in the wrong place, he's going to hit it a long way." Francona, normally a by-the-book manager, is taking a gamble in the opener and starting Trevor Bauer, a 17-game winner during the regular season, in Game 1 instead of Kluber, who will start Game 2. Francona reasoned that in doing so he will have Kluber on regular rest again for Game 5 - if the series goes that far and if Mother Nature doesn't bring rain. It makes sense. Then again, it seems risky. Bauer is well aware of the damage Judge can do, but he's just as focused on rest of New York's lineup. "You've got some youth in there with big power," he said. "You've got some veteran guys in there too that balance everything out. They can do a lot of different things offensively, and they're very well balanced." So are the Indians, who don't have a hole in their lineup and finished strong, stringing together 22 straight wins from Aug. 24 to Sept. 14 and winning 33 of their last 37. Cleveland also went 5-2 against New York. None of that means anything now. "Everybody's even," Francona said. "What's going to matter is who plays the best. It doesn't matter who thinks somebody should win unless it's the umpires. It's going to be who plays the best." PEN PALS: Cleveland and New York boast two of baseball's best bullpens, stacked with hard-throwers, specialists and elite closers. Yankees manager Joe Girardi showcased his stellar relief corps Monday night after starter Luis Severino was chased in the first. Chad Green, David Robertson, Tommy Kahnle and Aroldis Chapman combined for 8 2/3 innings of one-run relief, striking out 13. The Indians have plenty of arms, too, including Andrew Miller, virtually unhittable last October. "These are two teams that can shorten the game real quick with the bullpens that we have," Indians center fielder Jason Kipnis said. "It's not just versus the Yankees, it's in any game that we'd like to score early and often and keep pressing. It's just even more-so the case with how good they have those guys back there." BRANTLEY'S BACK: Michael Brantley watched last year's postseason ride. This year he's on it. The All-Star outfielder has recovered enough from an ankle ligament injury to make Cleveland's postseason roster. He'll be used initially as pinch-hitter, but it's possible he could play in the field. "I tested it pretty hard the past couple days and everything has responded well and I'm very excited about that," he said. "We'll see how it goes from there." GROUNDED: Bauer's run-in with the propeller on one of his hobby drones nearly derailed the Indians' postseason run last year. He's being much more careful this October. Bauer recently lost one of his drones when he crashed it in a local park. He suspects it was stolen. "Still missing," he said. "I've pretty much given up on it. So I started the process of building a new one. I took the props off this year, though, so we should be good."